In a large pot, heat oil over medium heat. Sauté onion, garlic, dill and 1/4 tsp (1 mL) pepper for about 5 minutes or until onions are softened. Stir in potatoes, corn and water; bring to a boil over high heat. Cover, reduce heat to medium-low and simmer for 5 to 10 minutes or until potatoes are almost tender. Increase heat to medium. Whisk flour into milk and gradually stir into pot. Stir in salmon. 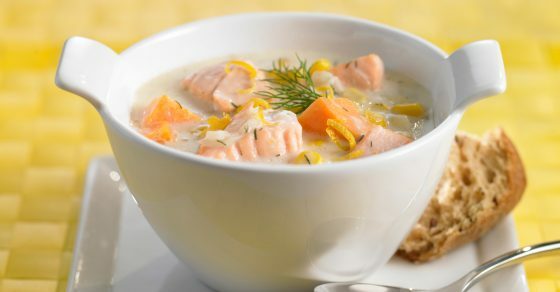 Simmer, uncovered and stirring often but gently, for about 5 minutes or until salmon is firm and opaque and soup is thickened (do not let boil). Stir in lemon zest and juice and season to taste with pepper. Ladle into warmed bowls. Prep Time: 10 min. Cook Time: 25 min. Makes: 4 servings Source: www.heartandstroke.com (recipe provided by Emily Richards, PH Ec.). Dr. Scott Wilson is the Founder & Chairman of Physiomed; one of Canada’s largest franchised networks of inter-disciplinary healthcare clinics. A graduate of Canadian Memorial Chiropractic College, Dr. Wilson founded Physiomed in 1994 and has since grown Physiomed to over 30 clinics in Southern Ontario and British Columbia. With hundreds of practitioners from over a dozen disciplines, Dr. Wilson and Physiomed have helped over 100,000 Canadians with physiotherapy, chiropractic, massage therapy, orthotic therapy, compression therapy and clinical conditioning as part of a program of rehabilitation and health optimization. In addition to helping patients improve their physical and mental well-being, Dr. Wilson has also mentored hundreds of practitioners to provide better care while enjoying more fulfilling careers. He is also a keynote speaker on many health related topics including how physiotherapy, chiropractic and health & wellness treatment can help with stress, weight loss, and unlocking the true potential within to achieve lasting physical well-being.